When looking for a patio dining solution for four, the Better Homes and Gardens Victoria 5 pc Dining Set should be on your short list. 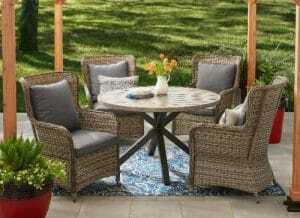 With a round table and for chairs this set will do well in outdoor conditions. Cushions for the seat and backs will give you hours of comfort. The resin wicker finish for the chairs will give you a rich look in your outdoor patio area. The round table will offer support for a market umbrella (not included). A nice cross leg design will support the table and umbrella. This patio dining set will work great for those who do not like a lot of assembly and like the look of the woven resin wicker. Now lets look at my details of this set. You will get four straight leg chairs with metal frames and full coverage of woven resin wicker. Table will be a round design with a slate top and a powder coated finish that will look like wood grain. Table legs will be a cross design with the legs meeting in the middle halfway down. Full woven wicker material will close the arms on the chairs for that full wicker look. The resin wicker material is made from recycled materials, so it is good for the environment. A deep brown color will match most outdoor decors. Chairs will have a wicker seat base to support the box shaped cushion. Back cushion is the pillow type with a knife edge. Cushions can be reversed if damaged or stained. Your cushions will have Olefin fabric covers, this material is one of the best for patio furniture. I would still recommend storage for the cushions when not in use to prolong their outdoor life. Table will be 46.5 inches wide with a round top. Top slates will be bordered by a ring around the top. Four legs will support your table, they are welded where they meet halfway down. A hole for a market umbrella is included in the table top and where the legs meet for support, plug for table top when no umbrella is used. Umbrella is not included with this set, for my market umbrella choices, see my post here. The Victoria 5 Pc Dining Set will be great for those small outdoor areas that you need seating for four for eating a meal. It will be very solid and the cushions are made from one of the better materials for outdoor furniture. If you would like to look at more of my ideas on dining sets with four chairs, look at my posts here. This patio set will require very little assembly, just the table needs to be put together. All tools required will be included in the hardware pack. You should be sitting on your chairs at the table within a half hour of opening the box. Chair legs will attach together before being attached to the table top. Do the final tightening of all hardware while the table is sitting on a flat level surface for the best results. Add cushions to chairs and you are ready for that cool refreshing beverage. As with most powder coated painted patio furniture sets, do not use any harsh chemicals, it will damage the paint. Even if you use a glass cleaner on the table top, the paint will start to discolor and peel. Fabric should be just cleaned with a damp cloth, covers do not have zippers to be removed for cleaning. For a modest price, this Victoria 5 Pc Dining Set will work well for small outdoor spaces. Simple assembly will have you sipping your favorite cool adult beverage at your table in less than a half hour. The painted wood grain finish for the table will look great and match most outdoor decors. I like the looks and feel of this set when I sat in it at the store, it was very comfortable. Very little upkeep will be needed, just storing the cushions when not in use. For a storage solution for the cushions, see my post here. If you would like to add something to this article or have a question, use the forms below and I will get back to you shortly. This looks interesting. Nice and small. The price is fine as well. Thanks for a review. Thanks for stopping by again. This is a nice patio conversation set for the price and it has the wicker look that most are looking for their outdoor space. I’ve always wondered why outdoor furniture has to be so expensive. I can see that this is designed well, and should last for many seasons in the outdoor elements. It’s a bummer that, for this price, they do not include an umbrella. Especially since there are cheaper options that do. Being made from recycled materials is nice. We have to do what we can to protect the Earth. If you are looking for a cheaper option, a set with folding chairs, a table and umbrella is available for under $100. I have a older model of this set and it works well for me. If you want to look at my review follow this link to my review of cheaper patio dining sets.